"My guess is we'll have 20 to 25 states that will have prices below where they were a year ago," he said. "It could be in the $3.40s (a gallon) by next week. There's a huge swatch of the country that's going to be closer to $3." Five East Coast refineries producing gasoline were all in the path of Sandy. The Linden, N.J.-based Philips 66 (PSX) refinery, one of the nation's largest, remained closed Tuesday after it was shut pre-emptively ahead of Monday's storm. The plant did see some flooding, and it was awaiting a return of power in the next day or two. But several other refineries, which had been operating at reduced levels, were restoring operations. Police in Belgium are investigating the killing of a British oil executive gunned down in front of his wife in an assassination-style killing. Nicholas Mockford, 60, was shot as he left an Italian restaurant in a suburb of the capital Brussels. The shooting happened on Sunday October 14 - but news about the murder has only emerged after Belgian police imposed a news blackout. The ExxonMobil executive was shot three times - once as he lay on the ground - after leaving the Da Marcello restaurant. BRUSSELS (AP) — So far, it's still a mystery. Was the killing of Nicholas Mockford, a 60-year-old executive for ExxonMobil, the world's largest oil company, a car-jacking gone wrong? A muffed purse-snatching? Or was it a cold-blooded professional hit for reasons yet unknown? Mockford, a British national living in Belgium, was shot dead on Oct. 14 as he left an Italian restaurant in Neder-over-Heembeek — a village in medieval days that has since been swallowed up by the expanding capital. He died in the street as his wife cradled him in her arms and a neighbor tried to resuscitate him. Mockford and his wife, Mary, left Da Marcello restaurant about 10 p.m., the report said. They crossed the street toward their car, identified by news reports as a Lexus. When they reached the car, an assailant "threatened" Mrs. Mockford, hit her several times in the face, and tried to yank her bag away, police said. Suddenly, a second assailant fired four shots at Mockford, who died at the scene, according to police. The man said Mrs. Mockford mentioned a white van, so neighbors originally thought her husband had been the victim of a hit-and-run accident. "I stayed with the man, but he stopped breathing," the neighbor said. "I resuscitated him and he came to. Then he became unconscious again and at that moment the ambulance arrived. A spokesman for ExxonMobil said Friday the company was "shocked by the very tragic death." The company, headquartered in Irving, Texas, did not immediately respond to further requests for comment. Mockford grew up in Leicestershire in the English Midlands. He reportedly moved abroad years ago, living in Belgium and Singapore. He is believed to have worked for ExxonMobil since the 1970s and was head of marketing for interim technologies for ExxonMobil Chemicals, Europe, promoting new types of greener fuel. He had been married to his wife, who is Belgian, for 15 years. His three adult children from his first marriage live in Britain, the Telegraph said. Mockford was also a sailor and a golfer. A sailing team of which he was a member reportedly won a race in the English Channel last year. And for the last seven years or so he had been a member of the Steenpoel Golf Club, a nine-hole course just outside Brussels. The club secretary, Andrew Watson, told The Associated Press that Mockford was a keen if ordinary golfer, showing up about once a week. "Everybody at this club is completely shocked," Watson said. "He was a very easy going guy. Very polite, very pleasant." Mockford never mentioned anything about enemies or any work-related conflicts, Watson said. "Absolutely not!" Watson said. "He never had a bad word about anyone." SANTIAGO DE CHILE - Tenova Mining & Minerals has announced that Tenova TAKRAF and Tenova Bateman Technologies will design and deliver a copper ore handling/processing system and a Solvent Extraction (SX) - Electrowinning (EW) plant, to produce 80,000 tons per annum of fine copper cathodes for Minera Antucoya, part of Antofagasta plc. The new plant, with a life time of approximately 20-years, will be located at Antofagasta region, approximately 45 km east of the Group’s Michilla mine, Chile. These contracts will include engineering, supply of proprietary equipment, construction, training, commissioning and start-up supervision. Tenova TAKRAF will provide an agglomeration plant, an on-off leach pad measuring 3,000 m by 800 m and a waste handling system and Tenova Bateman Technologies will supply the SX plant based on Bateman SettlerTM technology. This is a proprietary reverse-flow mixer-settler (RFMS) technology, which was developed and patented by Bateman and which is used in various plants in Chile, including Codelco’s Gaby plant and Vale’s Tres Valles plant. Jointly, the two Minera Antucoya contracts are the largest project ever awarded to Tenova Mining & Minerals, the division of Tenova focused on serving the global mining & minerals and metals industries. The combination of biddings for the Minera Antucoya project reflects Tenova’s strategy looking forward, offering a full range of technologies and engineering services to provide clients with a unique one stop total solution source across the full mining value chain, harnessing the capacities and capabilities of multiple business units strategically located around the globe. Tenova TAKRAF is a world leading supplier of a complete range of systems for the mining and bulk handling sector and Tenova Bateman Technologies provides solutions covering; Leaching, Solvent Extraction and Electro-winning, Beneficiation, Purification, Sulphuric and Phosphoric Acid Plants. Tenova is a worldwide supplier of advanced technologies, products and engineering services for the iron & steel and mining industries providing innovative, integrated solutions for complete process areas. Tenova's network companies operate in 26 countries on 5 continents with more than 4,900 people. NEW YORK (AP) - U.S. oil output is surging so fast that the United States could soon overtake Saudi Arabia as the world's biggest producer. The Energy Department forecasts that U.S. production of crude and other liquid hydrocarbons, which includes biofuels, will average 11.4 million barrels per day next year. That would be a record for the U.S. and just below Saudi Arabia's output of 11.6 million barrels. 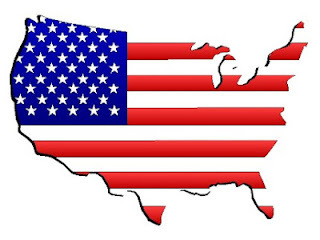 Citibank (C) forecasts U.S. production could reach 13 million to 15 million barrels per day by 2020, helping to make North America "the new Middle East." The companies profiting range from independent drillers to large international oil companies such as Royal Dutch Shell (RDS-A, RDS-B), which increasingly see the U.S. as one of the most promising places to drill. ExxonMobil (XOM) agreed last month to spend $1.6 billion to increase its U.S. oil holdings. - A long period of high oil prices has given drillers the cash and the motivation to spend the large sums required to develop new techniques and search new places for oil. Over the past decade, oil has averaged $69 a barrel. During the previous decade, it averaged $21. - Production in the Gulf of Mexico, which slowed after BP's (BP) 2010 well disaster and oil spill, has begun to climb again. Huge recent finds there are expected to help growth continue. - A natural gas glut forced drillers to dramatically slow natural gas exploration beginning about a year ago. Drillers suddenly had plenty of equipment and workers to shift to oil. The International Energy Agency forecasts that global oil prices, which have averaged $107 per barrel this year, will slip to an average of $89 over the next five years - not a big enough drop to lead companies to cut back on exploration deeply. 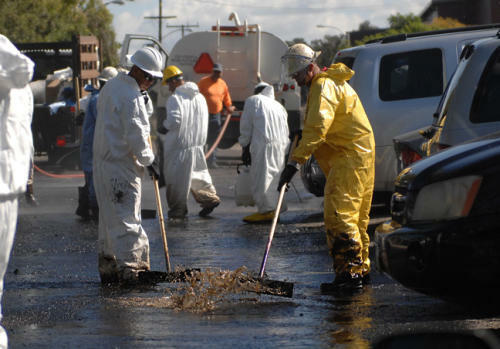 Oil spilled from a tank farm at Signal Hill in Los Angeles, California on 23 October following a pumping fault. The oil entered a public neighbourhood and was seen flowing down streets, resulting in a shutdown of roads and a major intersection. Police urged drivers to steer clear of the area. According to Los Angeles County Fire Inspector Quvondo Johnson, some oil did flow into the storm drain system, although the exact volume is not yet known. The storm drain empties into local waterways and authorities from the California Department of Fish and Game and the US Coast Guard responded to the leak for fear of contamination. Los Angeles County Health and Hazmat crews were also called the incident, which was reported just before 8am. The spill was caused when a high pressure line pumping crude oil into a tank backed up and overflowed. The oil was contained within 30 minutes, with clean-up expected to take around one day. Johnson said the spill is 'static' and 'under control', with the team now 'working on clean-up'. It is now up to state authorities to determine whether the tank farm should be fined. The Los Angeles CARBOB cash differential fell 22.75 cents on October 16 into single digits from its October 4 record of NYMEX November RBOB futures plus $1.45/gal. Platts asssessed the main grade of California-specific gasoline at plus 7 cents/gal, where it was heard traded at its lowest mark since September 12, Platts data showed. "Plus $1.45 all the way to 7 (cents) -- crazy," said one gasoline trader, who noted severe backwardation in the market has hurt demand. October 16 also marked the first day of the last shipping cycle before winter grade gasoline officially starts, which traders said caused some schedule easing. Supply also has been stable as ExxonMobil's Los Angeles refinery returned to normal a week after an October 1 power outage triggered the sudden rise. "It seems like there's plenty of gasoline everywhere," said Carl Larry, president of Oil Outlooks and Opinions. The American Petroleum Institute late on October 16 released data showing virtually no week-over-week change in US West Coast gasoline stocks at 26.9 million barrels for the week ended October 12, although it was lower than the 28.46 million barrels for the same week last year. "There hasn't been much demand," a market source said. "Buyers are pulling back." NYMEX November RBOB settled 50 points lower at $2.8453/gal, and Platts assessed it at 3:15 p.m. EDT at $2.8407/gal. That put the outright price for Los Angeles CARBOB at $2.9107/gal, its lowest since July 31. It was also well off the record of $4.3851/gal on October 4. "I was kind of shocked after seeing plus 36 (cents) done yesterday and now 8 (cents). Wow," a second trader said of midday trades. "I'm still waiting for retail to drop. "It's only down 10 to 20 cents per gallon depending on the location." The Energy Information Administration said the West Coast regular unleaded average dropped just 1.8 cents/gal to $4.391/gal in the survey week ended October 15. 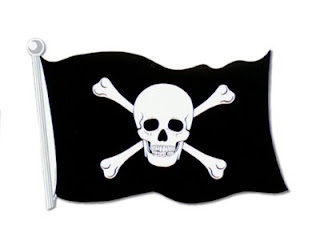 KUALA LUMPUR, Malaysia (AP) — Sea piracy worldwide fell to its lowest level since 2008 over the first nine months of this year as navies and shipping companies cracked down on attacks off the coast of Somalia, an international maritime watchdog said Monday. The International Maritime Bureau said 233 attacks were recorded worldwide in the first nine months of this year, down from 352 in the same period last year. The bureau's piracy reporting arm, which is based in Kuala Lumpur, said 24 vessels were hijacked worldwide between January and September 2012, with 458 crew members taken hostage and six killed. The numbers fell because attacks off Somalia's coast plummeted during that same period, from 199 last year to 70 this year. The bureau said only one Somali attack was reported in the entire third quarter of 2012. 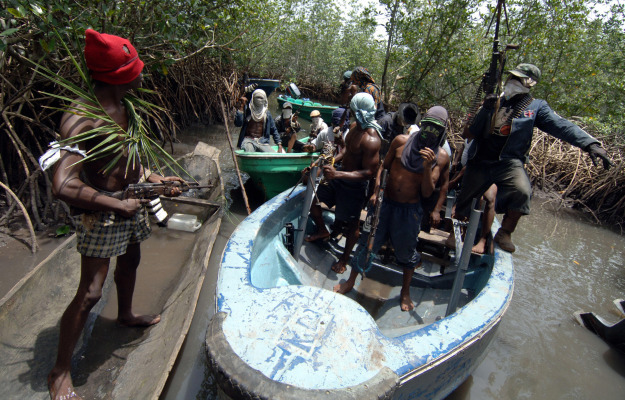 The bureau said piracy in Africa's Gulf of Guinea, ranging from Benin to Togo, was becoming increasingly dangerous, with 34 cases in the first nine months. 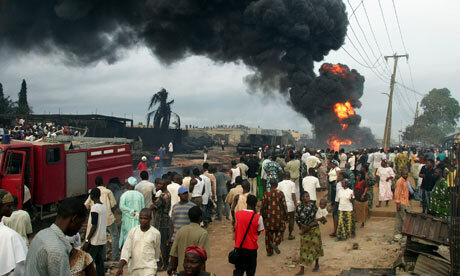 It said the attacks were often violent, planned and aimed at stealing refined oil products. Mukundan said 21 attacks were recorded in Nigeria alone, but he praised the country's navy for helping to rescue vessels. He said many navies in the vast gulf don't have resources to fight piracy far out at sea, allowing gangs to shift their operations to other areas. A Goldman Sachs sign is seen over their kiosk on the floor of the New York Stock Exchange, April 26, 2010. LONDON (Reuters) - Wall Street giant Goldman Sachs (GS.N), one of the biggest banks in commodity trading, slashed its oil price forecast following years of super-bullish recommendations as it said oil output was soaring in the United States and Canada. Goldman, which up until now had the highest oil price prediction among major forecasters, said on Thursday it cut its 2013 Brent crude oil price forecast to $110 a barrel from the previous $130 per barrel. On a longer term basis, the bank now expects Brent prices to stabilize at $90 a barrel. 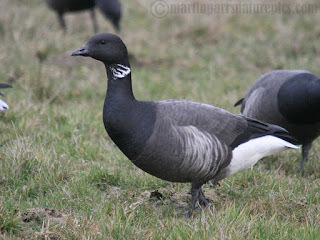 Brent was trading at around $112.8 on Thursday. "Over the past three years long-dated Brent crude oil prices have shown signs of stabilizing around $90 per barrel. This suggests a return to the pricing regime that characterized the crude oil market in the 1990s," Goldman said. "We expect that going forward long-dated oil prices will be anchored by the potential for substantial growth in crude oil supplies from U.S. shale, Canadian oil sands, and the deepwater. Net, we see a return to a structurally stable, but cyclically tight market," said Goldman. The U.S. shale oil boom, which saw the country's oil production rising to multi-decade highs, caught many industry watchers and specialists by surprise and has dramatically reshaped the global oil flows over the past few years. The United States is now importing less crude from West Africa and the Middle East, leaving more volumes for booming demand in Asia. Goldman was one of the main and most accurate forecasters of the 2003-2008 oil price boom, when unexpectedly robust demand in Asia outpaced global supply and prices soared on fears that the Organization of the Petroleum Exporting Countries (OPEC) would lack spare capacity to meet further demand. Goldman was, however, slow to revise its bullish forecast downwards when financial crisis hit the global economy in 2008 and oil prices fell four-fold to below $40 per barrel from their peaks of $147 in July 2008. This year, Goldman was also slow to acknowledge bearish trends in U.S. light crude, closing its trading recommendation to buy September 2012 U.S. light sweet crude futures, crystallizing an embarrassing loss of 10.8 percent. "Goldman was a little out of kilter with their $130 call. We have nudged up to that level on occasion but that's when you see U.S. gasoline go above $4 a gallon and that has a behavioral response," said Will Riley, who helps co-manage $284 million at the Guinness Global Energy Fund. 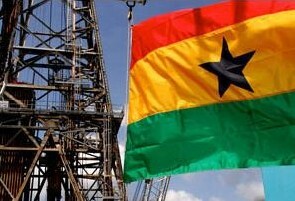 Ghana’s oil production is expected to inch up from the current 80,000 barrels a day to 90,000 by the end of the third quarter of 2012, representing a 6 per cent increase year on year. According to Renaissance Capital’s latest research report made available to CITY & BUSINESS GUIDE, it still sees an upside for oil production over the next four quarters given that it is projected to peak at 120,000 barrels per day in 2013 by Tullow Oil. Earlier last week, the Operations Manager of the Jubilee Partners, Robert Gettka, told journalists in Takoradi that oil production would increase from 66,000 barrels a day to 86,000 barrels a day. He stated that the increase was partly due to the successful oxidation exercise which was carried out to boost production. Oxidation is the process of involving the injection of acid into wells to facilitate the oil flow to the surface or onto an oil platform. Renaissance Capital’s report further projected that stronger growth from the extractive industry in the second half of 2012 barring any hitches in the gold mining sector. However, according to the report this growth is expected to be undermined by a poor showing from the manufacturing sector in the third quarter of 2012 due to another shutdown at Tema Oil Refinery related to the breakdown of critical equipment. On the services front, business services’ growth is also expected to remain robust. It is also anticipated that election-related spending would support the services growth in fourth quarter of 2012.
as November cargoes continued to depress Nigerian values. return to full production after maintenance. programmes, squeezing out bids for several grades. said still to be available for November. were said to be around dated plus $1.70 to plus $1.80. based on unreliability of loading dates and spec, traders said. load in December, up from 52 cargoes in November. Kissanje and a 920,000-barrel cargo of Kuito. the loading sheet from Sonangol showed. batch of trades for November. around 40 cents below levels discussed a month ago. Brent futures rose above USD 116 on Tuesday, underpinned by supply concerns after the European Union slapped more sanctions on Iran, while ample supplies and healthy inventory in top consumer the United States capped gains. The European Union cranked up pressure to force Tehran to halt its disputed nuclear programme with further sanctions on Iran's banking, shipping and industrial sectors. The measures came days after the Islamic Republic said it would negotiate on halting higher-grade uranium enrichment if given fuel for a research reactor. Front-month Brent crude, due to expire later in the day, gained 32 cents to USD 116.12 a barrel by 0625 GMT, after settling up USD 1.18. US oil gained 21 cents to USD 92.06. "Fundamentally there is no shortage of oil, with Saudi Arabia and others maintaining high output while inventory levels are also good," said Ken Hasegawa, a commodity sales manager with Newedge in Tokyo. "On the other hand, there is tension in the market with what is happening in Iran and the Turkey-Syria issue. That has put a floor on prices." The twin factors of ample supply and worries over a worsening crisis in the Middle East will keep oil well balanced unless the geopolitical situation worsens, Hasegawa said. He expected Brent to trade between USD 110 and USD 118 in the short term, for the next 10 days, with US oil in an USD 88-USD 95 range. The recent sanctions, one of the EU's toughest moves against Iran to date, reflect mounting concerns over the nuclear programme and also Israeli threats to attack Iranian atomic installations if a mix of sanctions and diplomacy fails. Iran maintains that its nuclear project has only peaceful energy purposes and has refused in three rounds of talks since April to scale back uranium enrichment unless major economic sanctions are rescinded. Brent was also supported by a possible delay in the restart of Britain's largest oilfield after maintenance, further hurting shipments of oil that sets the benchmark. That helped the contract's premium to US oil rise to USD 23.95 on settlement in the previous session. "Brent prices were supported by further delays in the restart of Nexen's Buzzard field after maintenance, which is the largest North Sea oil field," analysts at ANZ said in a report. Brent may edge up towards USD 117.92 per barrel as a rebound from the October 3 low of USD 107.67 seems to have been extended, while US oil may rise towards USD 94.06 per barrel, according to Reuters technical analyst Wang Tao. Yet prices are under pressure from expectations that US crude inventories rose for the week to October 12 due to an anticipated rise in imports, while weak demand may lift gasoline stockpiles, a preliminary Reuters poll showed on Monday. Adding to overall supplies, Saudi Arabia produced an average of 9.77 million barrels a day (bpd) of crude oil in September, an industry source said. According to official Saudi government figures supplied to OPEC, the world's biggest oil exporter, produced 9.75 million bpd in August and 9.80 million bpd of crude in July. "I think we are OK with supply inspite of losing a lot of Iranian exports," said a Singapore-based trader with a western firm. "Iraq is doing well, the United States is doing great and Libya, too. I don't see a problem there unless there is a war." Worries of a worsening economic outlook in the world's second-biggest oil consumer, China, apart from a prolonged crisis in Europe, are also weighing on oil prices. "Going by economic indicators, China's economy is not strong and there could be a slowdown in demand from China," Hasegawa said. "There is also a lot of uncertainty over the European situation." According to reports out of Nigeria the government plans to spend more than $1.6 billion in turnaround maintenance on three of its refineries. Speaking before the Senate Committee on Petroleum Resources Downstream Sector, Nigeria’s Minister of Petroleum Diezani Alison-Madueke said that the refineries in Port Harcourt, Warri, and Kaduna would see turnaround maintenance in an effort to get them running at full capacity. The maintenance is expected to begin in January 2013 and is scheduled for completion in October 2014. An article in THISDAY revealed that the Port Harcourt refinery has not been in operation and both the Warri and Kaduna refineries as of July have been operating at about 25% capacity. The refinery in Port Harcourt will be the first to undergo maintenance, followed by the Warri and Kaduna refineries. Over 75% of the parts needed for the maintenance on the Port Harcourt refinery have arrived the country. THE HAGUE (Reuters) - Four Nigerian villagers took Royal Dutch Shell to court on Thursday in a landmark pollution case that campaigners said could open the door to more compensation claims against international companies. The fishermen and farmers, together with the Friends of the Earth campaign group, accuse the oil major of polluting land and waterways around their homes in the Niger Delta region of Africa's top energy producer. Friends of the Earth said the claim, if successful, could open up a new way for plaintiffs to take on multinationals - by suing their parent companies in their home countries. The villagers, who appeared in court, want unspecified damages saying Shell and other corporations were responsible for pollution from three oil spills between 2004 and 2007. "My community is a ghost land as a result of the devastation. We had good vegetation. Today people have respiratory problems and are getting sick," said one of the plaintiffs Eric Dooh, from the Goi community, which lives between two pipelines. "Shell is aware of the whole devastation. I want them to pay compensation, to clean up the pollution so we can grow our crops and fish again," the 44-year-old told Reuters before the hearing. Shell says the pollution was caused by thieves breaking into pipelines to steal the oil, and believes it has played its part in cleaning it up. "The matter has been resolved as far as we are concerned and we do not properly understand why Friends of the Earth has submitted the case," Allard Castelein, Shell's vice president for environment, told Reuters before the hearing. The biggest pollution problem in the Niger Delta was caused by thieves who steal oil from Shell's installations, he said. Around 150,000 barrels of oil are stolen every day in the Delta. That is worth about $6 billion a year. Friends of the Earth said other companies could face similar claims in European Union cities if it won the case. "It opens up a range of possibilities for people from poor countries to use the legal system to seek compensation from companies," said Geert Ritsema, international affairs coordinator at the environmental group during a break in the proceedings. The Nigerians' lawyer Channa Samkalden told the court Shell had failed to maintain pipelines, clean up leaks and prevent pollution. "It was insufficient maintenance, not sabotage, that was responsible for the leaks ... Shell did not operate as a conscientious oil company," she said. With around 31 million inhabitants, the Niger Delta is one of the world's most important wetland and coastal marine ecosystems. It is an important source of food for the poor, rural population. Last year, the United Nations said in a report the government and multinational oil companies, particularly Shell, were responsible for 50 years of oil pollution that had devastated the Ogoniland region, part of the Niger Delta. Shell Petroleum Development Co (SPDC) is the largest oil and gas company in Nigeria, with production capacity of more than 1 million barrels of oil equivalent per day. It operates a joint venture in which state owned Nigerian National Petroleum Corp has a majority share. Total SA subsidiary Elf Petroleum Nigeria Ltd. also has a stake. Three judges are expected to deliver their verdict on the Hague case in the new year. “Today, what we have in the books is roughly 36.5 billion barrels in crude oil reserves as against 37 billion barrels two years ago. Whereas what we were planning for was 40 billion barrels. We really need to work very quickly to turn that trend around,” Olorunsola said. The drop in reserve replacement can be attributed to a drop in exploration investment over the uncertainty over the PIB. “We are really concerned because if you look at the reserves trend since 1956, we have always had an incline; we always had a marginal increase on year by year basis. Even the years we don’t particularly have increases, the reserves we discover was able to offset the production for that particular year, therefore having zero impact at the end of the day,” Olorunsola said. BP is to sell its Texas City, Texas refinery and other assets to US refiner and marketer Marathon Petroleum for $2.5 billion (€1.9 billion). The agreement includes $600 million in cash, an estimated $1.2 billion for hydrocarbon inventories and a $700 million six-year earn out arrangement based on future margins and refinery throughput. In addition to the 475,000 barrel per day refinery, Marathon Petroleum will also acquire connected natural gas liquid pipelines and four marketing terminals in the Southeast US. BP anticipates the transaction, subject to regulatory and other approvals, will close early next year. BP has raised over $35 billion since the beginning of 2010 through asset divestment and expects this to reach $38 billion by the end of next year. BP says it decision to divest the Carson and Texas City refineries are 'part of a major strategic refocusing of the company's global refining portfolio', while the BBC reports that the funds will be used to pay for the 2010 Deepwater Horizon oil spill. BP still owns around 8,000 BP and Arco-branded sites across the Midwest, Pacific Northwest and along the East Coast, and in a statement said it will 'remain a significant retailer of fuels' in the US. 'This sale will reduce BP's presence in the Southeast US, however BP remains firmly committed to growing and strengthening our BP-branded retail network and the value of the BP brand east of the Rockies in partnership with BP-branded jobbers and dealers,' says Doug Sparkman, president of the company's East of the Rockies fuels business. LOS ANGELES (AP) — It's a record, though just barely. The price of gasoline hit an all-time average high in California of $4.6140 a gallon Saturday, fueled by a reduced supply and a volatile market. The record was set by a fraction of a penny, according to AAA spokesman Michael Green. The previous high was $4.6096 on June 19, 2008. Prices throughout the state were expected to increase for several more days before leveling off, after a temporary reduction in supply triggered a price spike that saw fuming motorists paying $5 or more per gallon in some locations and station owners shutting down pumps in others. AAA's Daily Fuel Gauge report released Saturday said the average price for a gallon of regular unleaded across California rose 12 cents from its Friday mark of about $4.49. Saturday's price was the highest in the nation, with the Golden State leapfrogging Hawaii this week as the state with the most expensive fuel. The average price for a gallon of regular unleaded across California was 47 cents more than a week ago, according to the AAA report. "I seriously thought it was a mistake on the sign when we pulled in," said Nancy Garcia, 34, while filling her Honda Accord at a Chevron station in the Los Angeles neighborhood of Highland Park. She paid $4.65 a gallon for regular grade and said she couldn't afford to fill her tank all the way. When supplies drop, wholesale prices rise. Then distributors and station owners have to pay more to fill up their station's tanks. They then raise their prices based on how much they paid for their current inventory, how much they think they will have to pay for their next shipment, and, how much their competitors are charging. The national average Saturday was about $3.81 a gallon, the highest ever for this time of year. However, gas prices in many other states have started decreasing, which is typical for October. The dramatic surge came after a power outage Monday at a Southern California refinery that reduced supply in an already fragile and volatile market, analysts said, but the refinery came back online Friday and prices were expected to stabilize by next week. 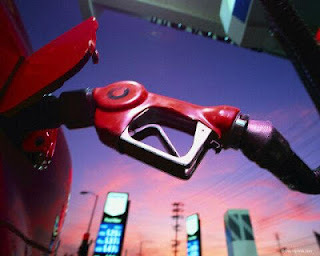 Patrick DeHaan, senior petroleum analyst at GasBuddy.com, predicted the average price could peak as high as $4.85. "There is some relief in sight but probably not for a couple of days. Early next week is when we may see some more significant declines ... but at retail prices, prices may climb for the next two to three days before they start to come down," he said. While prices were higher everywhere in California, there were variances Saturday. Chico had the lowest average price at $4.46, according to AAA, while San Luis Obispo was highest at $4.71. Prices averaged $4.67 in San Diego, $4.66 in the Los Angeles area, $4.55 in Fresno and $4.49 in Sacramento. The price of diesel has also increased, adding significant costs for truckers who typically put hundreds of dollars of fuel in their tanks. It's gotten so bad, some truckers may stop driving altogether, said Michael Shaw, spokesman for the California Trucking Association, whose members move 80 percent of the cargo on California's roads each year. "The fluctuation and rapid increase of prices makes it difficult to plan ahead and take on new contracts," he said. "It's difficult to operate in that environment." A web of refinery and transmission problems is to blame, analysts said. The situation is compounded by a California pollution law that requires a special blend of cleaner-burning gasoline from April to October, said Denton Cinquegrana, executive editor of the Oil Price Information Service, which helps AAA compile its price survey. "We use the phrase 'the perfect storm,' and you know what, this current one makes those other perfect storms look like a drizzle. I don't want to scare anyone, but this is a big problem," Cinquegrana said. "Run-outs are happening left and right." Among the recent disruptions, an Aug. 6 fire at a Chevron Corp. refinery in Richmond that left one of the region's largest refineries producing at a reduced capacity, and a Chevron pipeline that moves crude oil to Northern California also was shut down. Exxon Mobil Corp. said a refinery in Torrance returned to normal operations Friday after the power failure Monday disrupted production for most of the week. State officials said with the refinery coming back online, prices should start falling. Gasoline inventories in California, however, are still at their lowest point in more than 10 years, a situation made worse by the mandate for the special summer gasoline blend. Few refineries outside the state can make it, meaning there are few outside sources to draw from for help, Cinquegrana said. The California Air Resources Board was reviewing a request from the California Independent Oil Marketers Association for a waiver that would allow gas stations to begin selling winter-blend gasoline before Halloween. Some stations ran out of gas and shut down rather than take the risk of buying gas at soaring prices only to be stuck with a glut of overpriced fuel if prices dropped or if customers refused to absorb the extra cost that would be passed along to them. Mark Mitchell, co-owner of the Coast Oil fuel distributorship in San Jose, told the San Francisco Chronicle that none of the gas stations he serves had shut down, although some station owners had discussed it. When spot prices hit their peak, the stations would need to charge about $4.89 to break even, he said. "We get the gas — it's just at what price?" Mitchell told the newspaper. "You're not going to sell much when it goes up 40 cents in a day." Nigeria LNG declared a force majeure on output after an attempt to steal crude oil from a pipeline led to a fire on the Bomu-Bonny trunk line operated by Shell. The force majeure took effect October 4. "An attempt was made to steal crude oil from the Bomu-Bonny trunk line and offload it onto a waiting ship that led to a fire on the line and on the ship on Sunday," a Shell spokesman said. Shell, which has a 25.6% in Nigeria LNG, last week shut its 28-inch Bomu-Bonny trunk line after oil thieves caused a fire, it said. The other stakeholders in Nigeria LNG are NNPC with 49%, Total with 15%, and ENI holds 10%. STANLEY, North Dakota (Reuters) - The retired men shooting the breeze at Joyce's Cafe in Stanley don't look like oil barons but appearances can be deceptive, especially in North Dakota. Take Robert Western, a farmer who was dressed in rumpled overalls and a baseball cap as he sipped coffee and discussed the oil boom that has transformed this once sleepy town. "Some of the younger people buy a lot more - machinery, vehicles, things like that," said the 75-year-old Western. "The rest of us, I guess it doesn't alter our lifestyle a great deal. I don't have a lot of needs." After he left, his friend Earl Rogstad remarked to a visitor: "It's too bad Robert didn't have his airplane ready... He offered last summer to fly me over and see (the oil wells) from the air." Western did not mention that he is co-owner of a Piper single engine propeller plane, according to FAA records. He did admit to receiving oil royalties from wells on his farm but locals said he is far from the richest man in town. It is not clear whether Western is a millionaire or merely wealthy. "You can't tell the average Joe farmer from the average Joe millionaire," said Ward Heidbreder, Stanley city coordinator. Average income in Mountrail County, the hub of the North Dakota oil production boom, roughly doubled in five years to $52,027 per person in 2010, ranking it in the richest 100 U.S. counties on that basis including New York City, and Marin, California. The boom could be creating up to 2,000 millionaires a year in North Dakota, said Bruce Gjovig, founder of the Center for Innovation at the University of North Dakota. Many oil region residents receive $50,000 or $60,000 a month in oil royalties and some more than $100,000, said David Unkenholz, a senior trust officer at First International Bank & Trust in Watford City, the seat of McKenzie County, which is the No. 2 oil producing county in the state behind Mountrail. The oil is so plentiful that in Stanley, where the population has about doubled to 3,200 in the last five years, a well drilled under the town means that many homeowners could receive a small oil royalty check. A lot of North Dakota's new wealthy simply stash the cash in savings and checking accounts with "ridiculously large" balances, banker Unkenholz said. The monster homes, ostentatious diamond rings or luxury sports cars of California and New York are virtually nonexistent in North Dakota. Looking for wealth here is a subtle exercise. Locals point to pickup trucks. The boom has boosted truck sales decked out with extras at Stanley's Ford dealer, Prairie Motors Inc, co-owner Gary Evans said. "They are a lot more elaborate, a lot more loaded up than what they used to be, even the accessories," Evans said. "There is a big demand for accessorizing a pickup truck - everything from running boards to grill guards to chrome wheels." Evans, 66, a part owner of the dealership since 1970 and manager of the services business, said most residents have not changed their buying habits, especially those over 50. "Some of these people you could look at and you don't even know if they have an oil well or not, and they may have several," said Evans, who grew up on a family farm west of Stanley and also has some mineral acres. One reason rich locals do not brag about their money is because some residents do not own precious mineral rights to the land and have missed out on the boom. Land and mineral rights can be separated and sold in North Dakota and often are. Royalties are paid based on oil produced and sold mainly in sections of land of one or two square miles in size. The owner of the mineral rights receives the royalties. It can be a complex exercise to divide rights among multiple land heirs. In simple terms, a well producing 100 barrels of oil per day sold at $80 a barrel would generate $248,000 in a 31-day month. 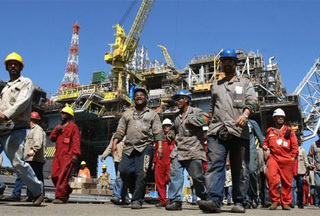 The state collects taxes on extraction and production of about 11.5 percent. From there, if the rights holders have one-fifth royalties, they would receive $43,896 a month. 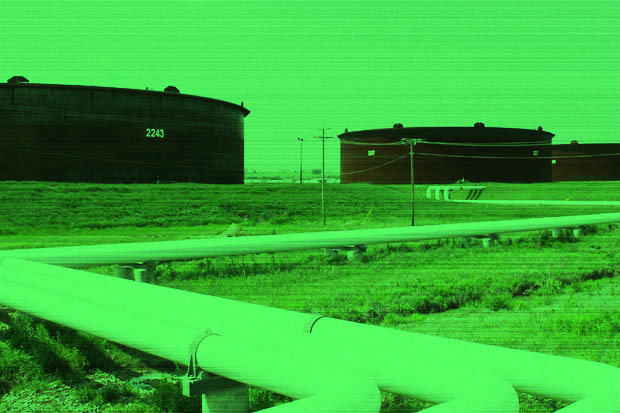 In July, North Dakota wells produced an average of 92 barrels per day but some produced more than 10,000 barrels in a month, a windfall for the royalty owners. Some of that money has gone to area churches in the form of anonymous donations and some to the schools for technology, said Heidbreder, the city coordinator. It's not just land owners who are benefiting from the boom. Oil has also brought high-paying jobs, and some of that money filters through to local businesses. So-called man camps have sprung up in North Dakota, where oil workers live in makeshift dormitories. At a man camp in Williston run by workforce housing provider Target Logistics, the 26 kitchen staff, all from outside the state, work 84 hours a week for six straight weeks, then take two weeks off, executive chef Jason Freeman said. Target Logistics has several man camps in western North Dakota, including a hotel and cabins at Stanley, mainly for energy employees. Its camp in Williston, the largest area town, looks like a military base with room for about 800 workers, a huge cafeteria, weight room, lounge and other facilities. "This is a thriving economy. This doesn't exist anywhere else," said Freeman, who lives in central Minnesota. There are downsides to the oil rush. Crime reports are up in Stanley, even if not as much as the population. Aggravated assault reports rose 55 percent last year in the oil producing counties, according to state figures. Gayleen Grote, who lives on a family farm north of Tioga in the oil patch, said she has a permit to carry a concealed weapon and sometimes puts a semiautomatic pistol in a bra holster. "There is a lot of testosterone," said Grote, adding that though she has never had to get aggressive, male drivers have stopped several times while she was walking by herself on area roads. "There is nothing to do but drink," she said. Earnings for the biggest crude tankers will be 25 percent lower next year than previously estimated as increased U.S. shale-oil production curbs imports into the country, DNB ASA said. Very large crude carriers will earn $21,000 a day on average in 2013 and $22,000 in the following year, 24 percent below its prior estimate, the Oslo-based bank said in a report dated Sept. 27. Smaller Suezmax vessels will bring in $18,000 daily next year, a 25 percent reduction. Annual imports into the U.S., the world’s biggest oil consumer, are set to fall by 550,000 barrels a day, DNB estimated. 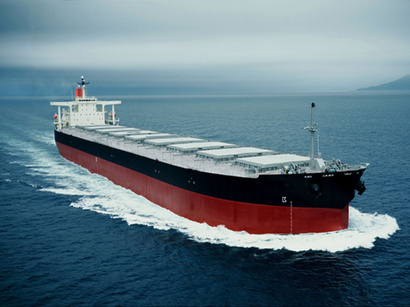 Each VLCC can hold 2 million barrels of crude, double the capacity of a Suezmax. Trade in smuggled fuel from Nigeria oils economies of west Africa. Subsidies by Lagos lead to flourishing demand for illegal exports. Pictures taken by the Canadian photographer Daniel Hayduk reveal an intriguing, but essential, aspect of the west African economy. Contraband fuel purchased legally in Nigeria, where subsidies keep prices much lower than in neighbouring countries, irrigates the economies of the whole region. Every morning a flotilla of small boats approaches the Togolese coast, laden with Nigerian fuel. 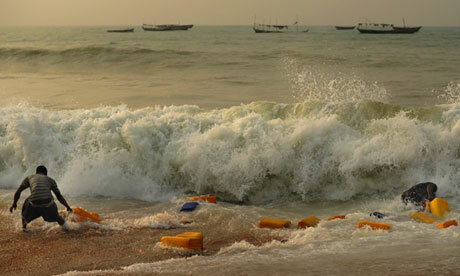 The jerry cans are thrown overboard and towed back to the beach by swimmers. The precious liquid is decanted for sale in the capital Lomé, but also in Ghana, Burkina Faso and even Mali. The beaches of neighbouring Benin are the scene of similar operations. Smuggling has reached an unprecedented level with the boom in global oil prices since 2008. It is hard to provide firm estimates but it certainly seems essential to the economies of each state. In November 2011, Benin's finance minister acknowledged that more than three-quarters of the fuel consumed there was illegally imported from Nigeria. In Togo, population 6 million, a 250-litre barrel sells for $300, a small fortune in a country where about two-thirds of the population live in poverty. Some smugglers and local dignitaries have reaped generous rewards, and "micro-petro-states" have sprung up on either side of the border between Togo and Benin, where "local officials … are largely independent of national law and its enforcement", according to an article published in March by the website ThinkAfricaPress. Despite the scale of the smuggling, the authorities have done little to stop it. Street vendors watch out for police raids, which are sometimes violent, but carry on selling the fuel in broad daylight. Corruption is not the only explanation. The racket is a serious problem for governments, but a source of work for many people, and a boon for all those who use the cheap fuel – the price is 15% to 30% less than in Togo's licensed filling stations. To stop such a flourishing trade is unthinkable in a country where the informal economy is predominant – accounting for more than 70% of jobs in sub-Saharan Africa, according to the International Labour Organisation. On the other hand, this illegal business entails a net loss for the already constrained budgets of these countries. International agencies, particularly the International Monetary Fund, issue regular protests, pressing for prices to be harmonised across the region. Nigeria is under pressure to end its system of subsidies. A Nigerian parliamentary report, published in April, estimated the subsidies had cost the nation $17bn in 2011, much more than the $8bn announced by the government. So far attempts to raise prices have failed, with general strikes forcing the authorities to backtrack. In January, yielding to popular outrage, President Goodluck Jonathan had to rescind his decision to raise the price of a litre of petrol from 60 cents to 85 cents. Most Nigerians see the subsidy as the only good thing about the oil industry, which has benefited an elite perceived as deeply corrupt. Genscape also places electromagnetic monitors beneath the power lines running into the Cushing tank farms to measure their power usage. This gives them an idea of how much oil is being pumped into and out of Cushing. The data is gathered and sold to banks, hedge funds and oil traders. Oil companies and tank owners are responding with tall barbed-wire fences, arrays of surveillance cameras and armed guards. Buy oil low in Cushing, and sell it high—just under the price of Brent—to refineries along the Gulf Coast. But getting the oil out of Cushing and into Texas refineries is the hard part. … by any means necessary, using barges (…) fleets of commandeered trucks, and trains, where they can find them. The companies that can pull it off can expect to make money—a lot of it. A Chinese shipyard has delivered the first of 12 supertankers to Iran, giving Tehran extra capacity to transport its oil to Asia, but it is unclear if the ship has the permits necessary to call at global ports, Business Recorder reported. Shipments, however, have become unpredictable as NITC's limited shipping capacity is overstretched, and industry sources said the arrival of the 318,000 deadweight ton "Panda" in the Persian Gulf in early October may help ease the strain. The very large crude carrier (VLCC) left Waigaoqiao Shipbuilding on September 18. It was initially due to sail to Iran in May, but the sanctions delayed its delivery. A second vessel, the Souvenir, is conducting sea trials in China, but it is unclear when it would begin commercial operations. "The first of Iran's VLCCs is on its way to Iran. 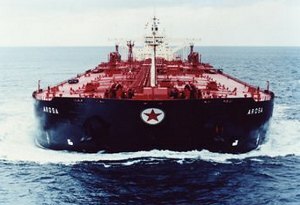 It is unclear how the tanker is being insured in light of the Western sanctions, but I'm sure Iran has found a way," said a Singapore-based oil shipping executive who declined to be named as he was not authorized to talk to the media. Seven more VLCCs are scheduled for delivery by the end of this year, with the remaining four being built in 2013, giving Iran greater flexibility to store and transport its oil. Royal Dutch Shell PLC says it has shut down a pipeline in Nigeria's oil-rich southern delta after a fire and a suspected attempt to steal crude from one of its lines. In a statement late Sunday, Shell said its Nigerian subsidiary shut down the 28-inch (71-centimeter) Bomu-Bonn trunk line after a fire there Sunday. Shell said the shutdown of the line would cut production by about 150,000 barrels of a oil a day. Shell said a helicopter saw a burning ship nearby. It did not discuss how much oil spilled in what it described as an attempted theft. Shell produced about 800,000 barrels of oil a day in Nigeria last year. Militancy in the region has dropped off after a government-sponsored amnesty program in 2009. However, violence, kidnappings and crude oil thefts still occur. 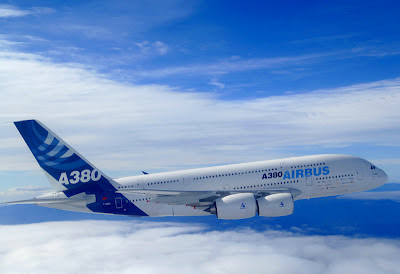 Aircraft manufacturer Airbus will work with China’s state-run oil and gas company Sinopec to develop a new type of biofuel. The project is named “1# biojet fuel” and will be produced at a new Sinopec refinery based in Hangzhou, which has a capacity to produce aviation fuel from biomass on a large scale. ‘Biojet fuel is becoming increasingly important in aviation and the energy market. It will help aviation grow sustainably and demand for fuel increase. Sinopec has developed its own technology for producing aviation fuel from biomass and waste oil and has already produced aviation fuel meeting international standards,’ says Sinopec senior VP Dai Houliang. Airbus will help chose the sustainable feedstocks to be used and push to get the new fuel certified across Europe and the US.